Don’t wait for the stars to align—find the perfect drink for your astrological sign with the Mixology of Astrology, by Allure magazine’s go-to astrologer, Aliza Kelly Faragher. True love is just one martini away…if you’re a Leo, that is. Meet your perfect (cocktail) match with Mixology of Astrology. No matter your sign, here you’ll find the best drinks for every occasion. Find Your Perfect Cocktail Based on Your Star Sign! "This book has just what I need. This is a fun and informative book. I certainly recommend it." "Whether you are just looking to explore astrology more, you are new to mixology, or you are a veteran star-gazer who knows your way around a shaker and has muddler or two among your spirited potions, this hardback book is a beautiful (the cover art is STUNNING!) addition to your library or would make a marvelous gift for a cosmically-inclined friend. Experience your next cocktail party by mixing drinks written in the stars!" "Your horoscope can drop hints about the direction of your life but what about when you hit happy hour with your friends? According to astrologer Aliza Kelly Faragher, your zodiac sign plays a role there, too, and her new book, The Mixology of Astrology, shows you how. Faragher’s book provides 16 cocktail recipes for every zodiac sign. Ultimately, Faragher hopes to make astrology accessible to people in their everyday lives. Her book is about having fun. Most of all, she hopes that practitioners use astrology as a way to be more compassionate to each other." "The Mixology of Astrology is a guide on how you can tap into the stars to determine your perfect cocktail match. The book not only tours each sign, but it also breaks down the multiple layers of astrology." "Here’s a fun gift for the friend who checks their horoscope daily. Categorized by astrological sign, the cocktails are mostly familiar easy-to-make classics, including some ‘modern classics’ like the Gold Rush and Cosmopolitan." 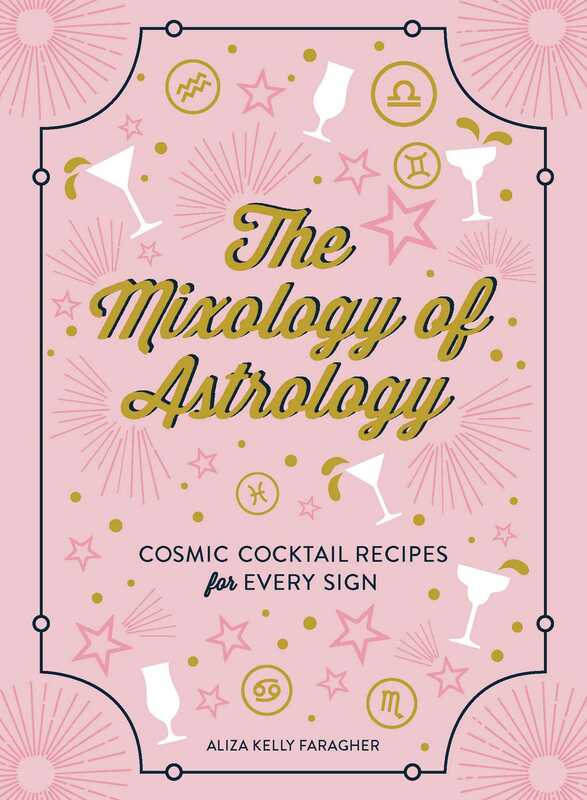 "Trusty guide … a must for any astro-lover, The Mixology Of Astrology by Aliza Kelly explores the favored drinking experiences for each zodiac sign … this book promises to inspire and delight no matter your style. A celebration of the spirit of your star sign Aliza celebrates each zodiac sign in its full authenticity, shining her celestial flashlight on what makes each sign glow." "The second I saw it, I knew it was meant to be a part of my life. The book is simply stunning and incredibly thorough … Aliza's book helped me embrace myself a little more—which is exactly what she intended to do. Whether you're an avid horoscope reader, such as myself, or you barely know anything about your zodiac sign, you'll benefit from having this recipe book in your life." "For your astrology-obsessed friend who also appreciates a good cocktail, this recipe book of drinks for every zodiac sign is basically the perfect gift." "The absolute perfect gift for anyone who’s super into their astrological sign and cocktails. I mean, could this get any better? Every star sign gets its very own chapter, so you’ll be sure to know what drinks will be a hit among you and your friends." "Demystify both the stars and the drink menu with The Mixology of Astrology. Meet your perfect (cocktail) match with this light spirited book. No matter your sign, here you’ll find the best drinks for every occasion."